"[At that point] (35km)I thought if I finished number five then that would be awesome"
- 2012 Boston Marathon Champion Wesley Korir who was 57 seconds back at that point and came back to get the win in the heat in Boston. American Jason Hartmann used a similar come from behind strategy to get 4th and he almost got the quote of the day for what he said here and here. See him here. How many of your friends are FLOPPING at Boston right now? 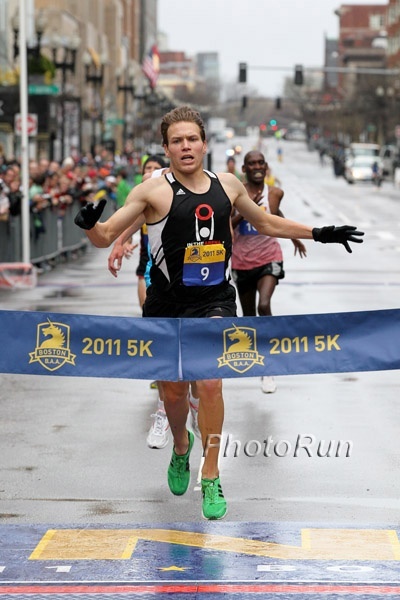 Would Ryan Hall Have Won Boston Today? Recommended: Excellent Post by Science of Sport on Boston Conditions: The Surge Between 25 and 30k and the Sun Did the Leaders In We'll have more LRC analysis but this post does an excellent job of explaining what happened. Also read this post that explains why telling people to over prepare for the heat may not be the best idea. And only 427 people deferred to next year's race. RRW: Wesley Korir Comes From Behind for Shock Victory Korir, the former University of Louisville, Ron Mann coached athlete was 57 seconds behind the leaders with less than five miles to go. Then the heat took its toll on leader Levy Matebo and Korir stormed to victory in 2:12:40 as American Jason Hartmann used a similar tactic to get 4th in 2:14:31. The winner was nearly 10 minutes slower than last year. Crazy. Champ Wesley Korir and Jason Hartmann Talk About Prevailing in the Heat, Geoffrey Mutai Not Too Upset About Dropping Out Hartmann: "I circled this on my calendar and every day this is what I prepared for. I wasn't gonna fail today. I came here to do something, fortunately for me it worked out"
RW Takes a Look at Retro Win for Wesley Korir Post race interview as well. Korir may do a lot of his training in Mennonite country in Canada but he is a great hot weather runner as he showed Monday and last year in Boston. Geoffrey Mutai Dropping Out Complicates Kenyan Olympic Picture "Time Plus" will be a key factor for selecting the team. 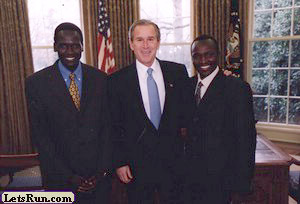 And Wesley Korir won't be on it. OK - Which year at Boston was hotter - '12 or '04? *MB: Rotterdam Marathon live stream *New huge PR for Moses Mosop! *New: Canova: Calf Injury Ts To Blame For Mosop's Struggles wCanova said Mosop ran on hard pavement the last 3 days in Kenya. 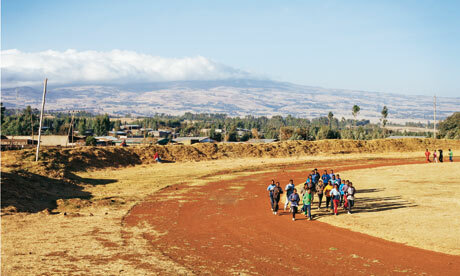 The Ethiopians credited their success to a change in their training regime to feature more speed work. Pre-Race: LRC Moses Mosop Goes For Glory: "Moses Has Speed That Has Never Been Seen"
Vienna: Haile G (60:52) Beats Paula Radcliffe As Radcliffe Runs Slowest 13.1 Of Her Career (72:03) Radcliffe came in after recently having bronchitis but was expecting better. Meanwhile, Kenya's Henry Sugut won the marathon in 2:06:58. *Paula To BBC: "I am at a loss to explain why it was quite so bad. I still would have expected and hoped for a time in the 69s." *Geb On Paula: "Paula is an inspiration but I would ask all British people not to expect too much of her. I don't expect Paula to win the Olympics." Dublin: MB Kenenisa Bekele Looks Majestic In His Return He destroyed the field and impressed at least once message board poster who seemingly watched the race. *IAAF: Bekele sparkles with 27:49 10km in Dublin Bekele was happy afterwards: "The good news is that all of my training which has been based towards to the track season, has shown to be successful here also." LRC 8 Days For Glory - A Kenyan Flavored Preview Of The Upcoming Men's Marathon World Record Assault Over 8 days starting this Sunday, six Kenyan men - the four fastest marathoners of all time (Geoffrey Mutai, Moses Mosop, Patrick Makau and Wilson Kipsang), plus double World Champion Abel Kirui and Virgin London Champion Emmanuel Mutai - will fight for three Kenyan Olympic spots on the streets of Rotterdam, Boston, and London. Debate Over Women's Road Racing Records Still Continues Desiree Davila: "It's like getting into baseball statistics where you say, 'It's the first home run in a Wednesday game when the sun was at 45 degrees. If we're going to qualify all these different things with the record, it's going to start becoming silly. I feel like it kind of takes away from it." Matthew Centrowitz And His Father Talk About How He Learned Strategy For The 1,500 Washington Post Matt Centro Sr. talks about how he used reverse psychology on his son to get him into track in the first place. Much Of London Opening/Closing Ceremonies Music Won't Be Performed Live Also, there is a rumor that the Spice Girls will be playing during the Games. Is The Use Of Hi-Tech Shoes & Uniforms Cheating? Where Are They Now? : Greek Drug Cheat Kostas Kenteris Talks about his career and staged motorcycle crash and history of missing drug tests. Q&A With Yelena Isinbayeva She refuses to reveal what she says when she's seen talking to her pole. 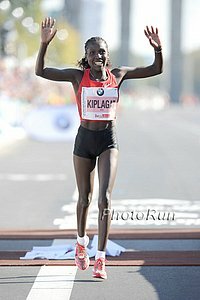 Recommended Read: Meet 2:19:44 Marathoner Florence Kiplagat, Who Is Focused On Winning London The former World Cross and World Half star was a soccer player in school who picked up running after being told do so by her uncle - 2:06:50 marathoner William Kiplagat. Her goal was to come to school in the US, but that didn't work out and the rest is history. A year ago, we wondered prior to Boston if she'd be the world's new marathon star. The answer seems to be yes. Her 66:38 half from February proves she is fit. Jeremy Wariner Runs 1st 400 Of Year - 45.64 - Leaves "a little disappointed." Last week, he split 44.58, so we understand why he's upset. He did say, "My strength is where I want to be at." Stanford Invite: Nice IAAF Recap Of Stanford: Areson Makes Up 35m Gap And Catches Lisa Uhl & Gets World Lead; Ritz Wins And More Dathan Ritzenhein won the 10,000m in 28:21 in his first track race in 2.5 years, Jackie Areson got an Olympic "A" qualifier in the 5,000 (15:18.31) as Lisa Uhl just missed (15:21). Chris Derrick won his slower section of the 1,500 in 3:41.17 to beat Evan Jager and Lawi Lalang, and Kevin Castille ran 28:57 10k at age 40! *Results Alan Webb's 2012 struggles continued as he ran 1:54.17 for 800m and then 40 minutes later 3:54.08 for 1,500m. Kiwi Olympic Racewalker Was DQed For Doing Forward Somersault At Finish Line Of 1st National Champs "Some people might get upset about [the disqualification], but I did what I set out to do and I wasn't too concerned whether they gave me a medal or not." Sharon Cherop Outkicks Jemima Sumgong Cherop was third last year and third at the World Championships but she got the huge win here as she outdueled countrywoman Jemima Sumgong. Believe it or not was the 5th straight year the women's race has been decided by 3 seconds or less. *RunnersWorld Article on Cherop's Win Post-Race Interview as well. *40 Year Old First American Sheri Piers is From Maine But Was Ready for Heat Thanks to Training on a Treadmill Text and Interview. *Steve Cram Says Don't Count Paula Radcliffe Out We agree 100%. 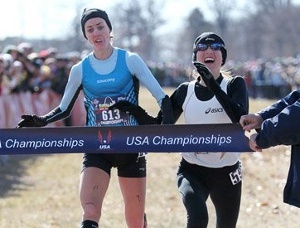 Paula ran a 1:12 half-marathon this weekend in her match-race with Geb but was sick beforehand. More Paula here. Listen in the player or download here as Rojo and Wejo broke down the race. BAA 5k: LRC Course Records Fall As Ben True Outkicks Sam Chelanga For BAA 5k Title As Werknesh Kidane Wins Women's Race Olympian Desi Davila was only 10th in the women's race but wasn't too upset afterwards. BAA Mile: Morgan Uceny & Collis Birmingham Earn Wins The times may not appear fast but remember it's on a 500-meter long block with 90-degree turns. Pre-Race: LRC Quest For $100,000 Begins At BAA 5k Believe it or not Sam Chalenga has a good shot at winning not this race but $100,000 and is up against Ethiopia's Ali Abdosh and defending champ Ben True. George Mason: LRC Alan Webb Redeems Himself With A 3:43 1,500m/ 14:15 5,000m Double, Robby Andrews Opens With 1:49 Win Alan didn't win the 1,500m, but his performance was so much better than last weekend's 1:54/3:54 debacle that all Alan Webb fans like this guy can breathe a sigh of relief. And the message boards went nuts with Webb: here, here, here, here. 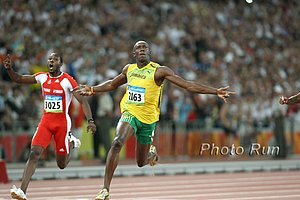 Jamaica: Usain Bolt Blasts Asafa Powell In 4 X 100 To Open Season World 100m champ Yohan Blake ran a super-impressive 9.90 to open the season as well and didn't even get mentioned in the Reuters article. 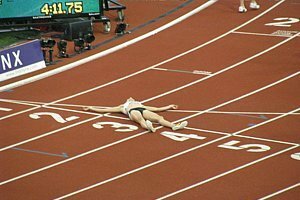 *IAAF Recap Of Bolt/Blake's Run With pics of small crowd. S. African Champs: Oscar P Only Runs 47.28, LJ Van Zyl Only Runs 51.00, Semenya Runs 2:02.68 To Win, Mulaudzi Runs 1:45.68 To Win Sounds like Oscar didn't try very hard, saying, "I felt like I was at the verge of pushing it into the red. I didn't see the point of really doing that." Semenya Wins But Doesn't Break 2:00 - Says It's Key She Doesn't Panic "It was okay for me. I retained my title but the race was a bit disappointing because we were hoping for a qualifier but unfortunately I didn't make it, but the time will come. I just need to be patient." Austin: Jeremy Wariner Runs 46.43 For 400m It was really, really windy. Oscar P Makes 400m Final With Slow Times At SA Champs This article says he "eased" to 48.34 and 47.91 in the semis. However, another article says he looked "sluggish." Caster Semenya didn't race as there were enough scratches to cancel the heats and advance her automatically to today's final. Stephen Mokoka Wins And Gets 10k Olympic "A" Standard At SA Champs He won in 27:40, but is leaning towards doing the Olympic marathon which he already qualified for. US's World Indoor 60m Hurdle Champ Aries Merritt Credits Success From Change To "7 Step" Approach He says with US depth, the Olympic Trials is harder than the Olympics, but that's definitely an exaggeration as he won't have to race Liu Xiang or Dayron Robles at the Trials. Would Steve Prefontaine Have Become A Legend In An Era With Few College Dual Meets? Seb Coe Says China Will Top Overall Olympic Medal Tables He predicts China, US, and then Russia and hopes UK could be 4th. Good: Japanese Comedian Hiroshi Neko May Be Ineligible For Cambodian Olympic Marathon Team The guy who deserves to go is Hem Bunting, who will be trying to break the 2:18 Olympic B standard at Sunday's Paris Marathon. NBA Players Ray Allen And Dwyane Wade Say They Should Get Paid To Play For Team USA At The Olympics LeBron James says he's happy to play for free, though. *Columnist Says No Way Olympic Players Should Be Paid "The chance to lean over, and have someone slip a gold medal over your head. For many, it will be the most cherished day of their sporting lives. That's not enough for someone? Then why be there?" Kenya To Spend ~$5.5 Million Marketing Itself At London Olympics Mary Kimonye: "These games are very important to the country considering that we have won more than 50 per cent of the medals since the Games began." Not sure where that stat came from, but it's clearly wrong. April 21st: Deep Mile Field For Kansas Relays Field has Nick Symmonds, Will Leer, A.J. Acosta, Russell Brown and Lee Emanuel. A Revised Fundraising Plan May Save Maryland Men's Track And Field Calls for no indoor team and an outdoor roster of only 14 opposed to 27. Article On OP's Jackie Areson, Who Set A 33-Second 5k PR To Get The Win And Olympic "A" At Stanford Apparently she had no idea what pace she was on until the last lap as her coach told her not to look at the clock until 400 to go. *The Wall Street Journal Positively Reviews Alberto Salazar's New Autobiography Pre-order the book today here (it's released tomorrow) and get Amazon price guarantee. LRC WTW: Is Jeremy Wariner Done? What About Alan Webb? Our Favorite Race Walker, Brie Felnagle, Chris Derrick, Running Movies and More We scan the world and wonder is Jeremy Wariner done? What about Alan Webb? Brie Felnagle definitely isn't and neither is David Adams. Chris Derrick has more speed than you thought. Plus we tell you about our favorite racewalker, talk about two running movies in the works, Bekoji Ethiopia, and we even give you some injury advice. LRC WTW: America's Newest Female Running Prodigy, Galen Rupp's Medal Chances, A Kenyan Gets 7 Years Older In 2.5 Months, Bekele's World Records And The World's Winningest Marathoner Who Is Not A Big Fan Of The World We span the globe so you don't have to. Can Atsedu Tsegay knock Galen Rupp off the medal stand at 10,000m? How does someone get 7 years older in 2 months? Plus info on America's latest distance prodigy and the World's winningest marathoner seems to not be a big fan of the World. Much more, including a great profile on Edwin Moses.